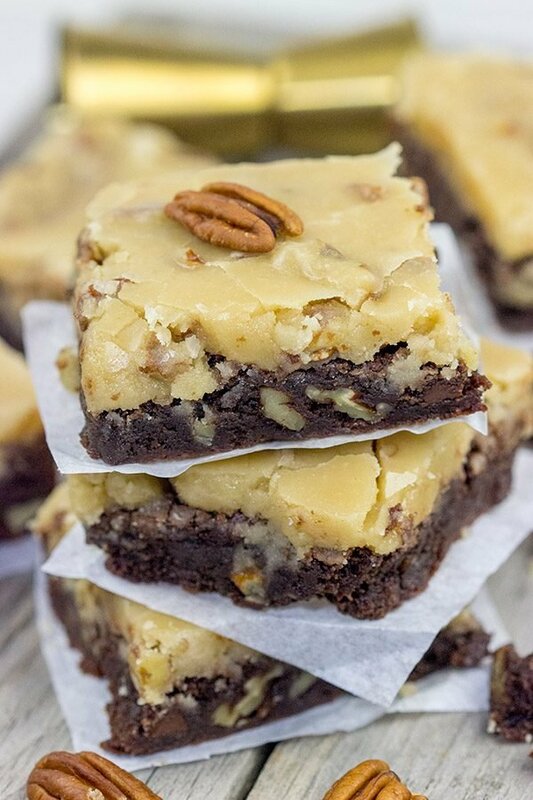 Bourbon Pecan Brownies - Chewy, chocolately brownies with a kick! 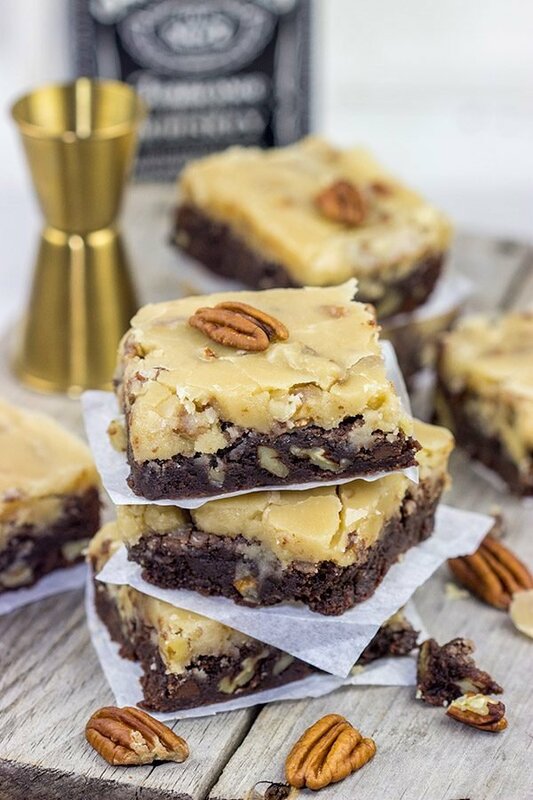 These Bourbon Pecan Brownies are a new favorite in our house! These chewy, chocolatey brownies are topped with a brown sugar + bourbon + pecan frosting…and the result is delicious! I put brownies in the same category as chocolate chip cookies. 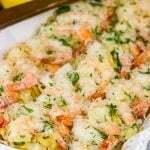 The number of different recipe variations is virtually endless. Take brownies for instance: chewy or cakey? Nuts or no nuts? If nuts, what kind? Frosted or unfrosted? I could keep on going here, but you get the point. 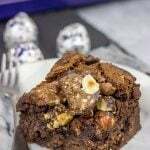 For me, I like a good chewy brownie with nuts. I don’t typically reach for a frosted brownie…but then again, I don’t typically make a bourbon pecan frosting! Is it just me, or has the bourbon market exploded in the past 5-10 years? I feel like there used to be a few choices at the store, but now there is an entire wall dedicated to different bourbons. I’m ok with that! Laura and I occasionally enjoy picking out a random bottle at the store, and we’ve discovered several of our favorite bourbons that way. While that bourbon typically gets consumed on a weekend evening in the basement, every once in a while I might steal a splash for a recipe. Laura certainly didn’t mind that I borrowed a couple teaspoons for these Bourbon Pecan Brownies! 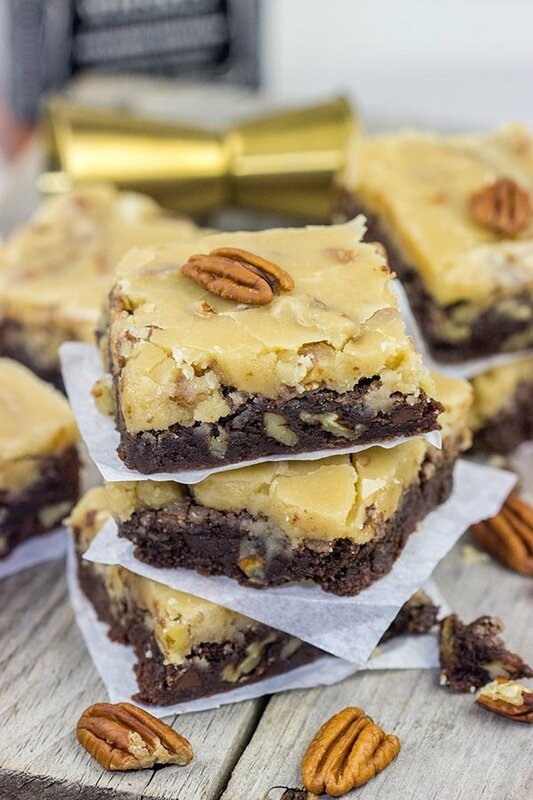 Even if you’re not a huge bourbon fan, I suspect you’ll enjoy these Bourbon Pecan Brownies! One of our friends isn’t a big bourbon guy, and he enjoyed these brownies. The bourbon adds an extra layer of flavor to the frosting, but it’s not overpowering at all. If you know it’s bourbon, then you’ll be able to pick out the flavor for sure, though. Either way, chewy chocolate brownies topped with brown sugar + bourbon frosting come together to create a dessert recipe that’s worth keeping! Bookmark it. Print it out. Screen shot. Do whatever you do. 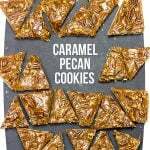 Just try not to eat the entire batch at once, ok? (Although I won’t judge you if you do.) Cheers, friends! Oh, and if you make these brownies at home, come back and share your thoughts. Or just snap a photo and tag me on Instagram (@Spicedblog). Love brownies? Check out some of these other favorites, too! 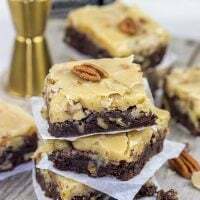 These Bourbon Pecan Brownies are a new favorite in our house! These chewy, chocolatey brownies are topped with a brown sugar + bourbon + pecan frosting...and the result is delicious! Grease and flour a 9”x13” baking pan. Line bottom parchment paper (see note); set pan aside. Stir the chopped pecans and remaining ¾ cup of chocolate chips into the batter. Let brownies cool completely before frosting. Using a medium saucepan, add cream, butter and both sugars. Place over medium heat and cook, stirring occasionally, until mixture begins to boil. Continue boiling for 1 minute, stirring constantly. Remove pan from heat and stir in remaining ingredients (pecans, powdered sugar, vanilla extract and bourbon); let mixture cool for 5 minutes. Spread frosting evenly over brownies. Let cool for 1 hour, or until frosting has fully set. I recommend using an oversized piece of parchment paper so that the paper comes up at least 2” on all sides of the pan. As you add a frosting to these brownies, the extra parchment paper will give you a way to lift the brownies out of the pan once they’ve cooled. Brown sugar bourbon frosting!!! I think I could eat that all by itself! 🙂 I’m sure it’s even better paired with the brownies though. These look amazing! Oh man, that frosting is seriously tasty, Kathy! I typically enjoy just drinking my bourbon, but I’ve gotta say that bourbon is a fun addition to desserts…and frosting! These brownies didn’t last long around here! I had no idea bourbon had to be made in the US to be called bourbon. That’s so interesting! I love the flavor of bourbon but it’s something I rarely think to add to desserts; for some reason I always lean toward liqueurs in baking. But I’m totally trying these–I love a frosted brownie! Haha! Thank you so much, Dawn! I love a good brownie, but then add a bourbon pecan frosting on top? Oh yeah, that’s where I need to be! Thanks so much, my friend! Hi David! I’m with you on chewy brownies with nuts! Then to top them with bourbon frosting just takes them to a whole new level! I don’t drink bourbon, but I occasionally cook with it. Like bread pudding with bourbon sauce or chocolate bourbon truffles. Haha! You’re totally right about hiding that bourbon bottle, Neil. I poured out a little too much bourbon when I was making these brownies. (Accident? I think not!) Needless to say, it didn’t go back into the bottle. 🙂 But these brownies are delicious in their own right! Thanks so much, my friend! When it comes to brownies, it’s pretty easy for me because perfect brownies must meet the following criteria: 1. Chewy. 2. Nuts. Loaded with nuts. A mix of nuts is acceptable. A combination of nuts and dried fruit is acceptable (but npt preferable) 3. Unfrosted because they’re sweet enough without extra sugar… But wait, I don’t think I’ve ever tried a frosted brownies. Don’t worry though – this recipe sounds and looks perfect despite the frosting. Indeed it looks that a great addition. Besides, you cannot go wrong with a pecan – bourbon frosting, right? Delicious, my friend! I’m pretty close to you on our brownie preferences, Ben. Chewy is a must…otherwise it’s just chocolate cake. Nuts is a definite, too. 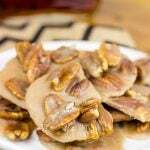 Pecans are my first choice, but walnuts are acceptable, too. I might have to differ on the dried fruit only because I don’t love fruit + chocolate. (I know, I know…call me strange!) But don’t sleep on a good frosted brownie! They’re delicious. And this bourbon + pecan frosting is good enough to eat with a spoon…not that I did that or anything. Haha! When I saw these in your Instagram feed I had to come over immediately to check out the recipe. Boy are these are kind of treat!! 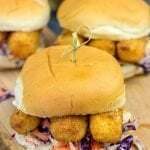 I need to whip up a batch of them to share at this Sunday’s Super Bowl party! Why thank you so much, Marissa! 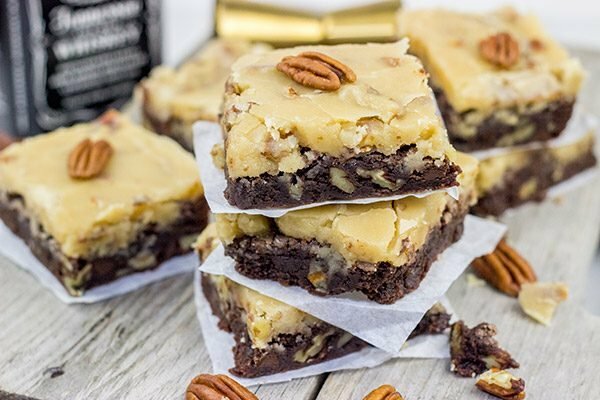 I normally don’t do frosted brownies, but when that frosting contains bourbons and pecans? Well, I have to do frosted brownies then! 🙂 I hope you had a great weekend, my friend! 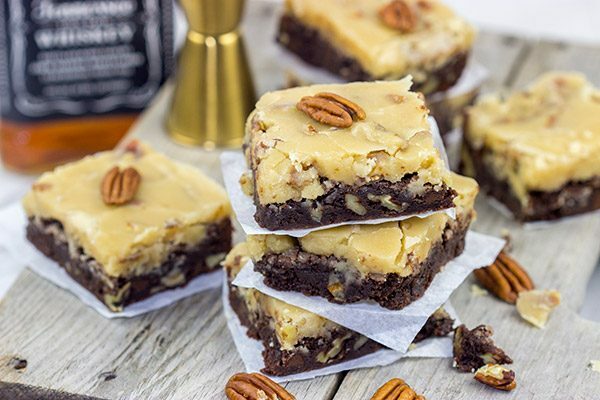 Bourbon Pecan Brownies, what a good idea. When I read the title I knew I remembered this frosting. Then when I read the recipe I remembered that my grandmother used to make a spice cake with a similar frosting and studded with pecans. I haven’t thought of that cake for years, but now I can almost taste the frosting. Having lived in bourbon country (Woodford County, KY) for 10 years, I can attest to the boom in the biz. Me, I’ll always be a Woodford Reserve type of bourbon drinker. Ohhh, I love a good spice cake, Ron. I often make one around the holidays, but I just didn’t get around to it this year. (I suspect it got replaced with packing boxes for the move. That’s not a good trade-off!) I’m more than a little jealous that you lived in bourbon country, too. Have you ever tried Woodfood’s Double Oaked? That’s our #1 go-to bourbon for drinking around here! I’ll cook with other stuff, but for drinking? It’s the double oaked! Cheers, my friend! David you are on a roll with these buttercreams and frostings! First I saw that marshmallow buttercream and now this bourbon pecan frosting! I am a bourbon lover for sure and I think I could eat this frosting with a spoon – hold the brownie – though together they sound divine as well! Haha…thanks so much, Shashi! What can I say? 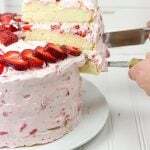 I love frostings and buttercreams! 🙂 I also happen to love bourbon. While I normally just drink my bourbon straight, I had fun with this bourbon pecan frosting on top of brownies. There is so much yumminess going on here! Thanks so much, my friend! 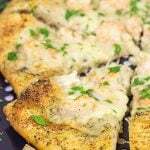 I’m dying over these David, the texture looks amazing, and your photos are stunning! Why thank you so much, Sue! These brownies turned out quite well, and I’ve gotta say that I’m a fan of baking with bourbon. 🙂 Hope your week is off to a great start, my friend! Should the brownies be cooled completely before frosting? My baking spidey-senses say yes, but the recipe doesn’t specify.